Let me introduce you to my garden....... I struggle for space in the borders now...... so I plant up in many pots, tubs and hanging baskets as I can’t resist an opportunity to squeeze in something new. I love its overgrown look and the way it obscures the view of what is around the corner. Wow your garden is brill, like others i'd like to see more. Welcome to goy hope you enjoy being with us. 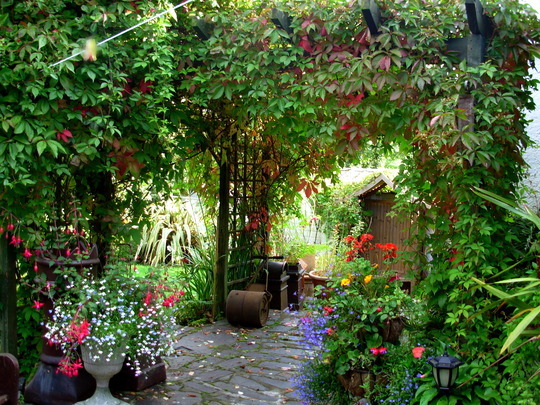 Wow, this is a beautiful secluded garden. Exactly how I am training mine to look like in 5 yrs time. I love gardens like that. absolute magical for me. Welcome to GoY from me too. What a wonderful garden you have created. Looking forward to seeing more. Wonderful. Really fantastic display. I love the overgrown feeling as well. Great execution! I'm quite new too, this pic instantly appealed to me, as I have a small 'informal' patch too. Really beautiful - makes you want to go round the corner. Okay, I'm curious, just what is it that is being obscured around the corner.? Great picture. Thanks so much for the welcome and all the lovely comments you have left for me...... I’m pleased you enjoyed the first glimpse of my garden. We've all been enjoying the sunshine. Garden takes priority in this lovely weather. We know you'll catch up and visit when you're ready. What a beautiful garden! It's so full of interest and colour. gorgeous.....is that Virginia Creeper over the trellis? Wow!! What a beautifull garden you have! More photos please! What everyone else has said and more, smashing picture, it is what gardening is all about, creating magic. Perfect. I just love it.